LaCie’s Rikiki (the company says rikiki is French for “tiny”) is a small USB-only portable hard drive for users who want the most compact and potent hard drive possible. While not designed for the heavily loads of audio/visual professionals, the Rikiki is a solid on-the-go drive with few frills but satisfactory read and write speeds for its class. The Rikiki weighs only 5 ounces and is only slightly wider than an iPod touch. It can easily fit in your pocket, backpack, or purse. The aluminum exterior is sturdier than some of the lighter drives we’ve tested, but it’s by no means on par with the sturdier Starck Mobile Hard Drive ( ). When first plugging in the Rikiki, LaCie’s Setup Assistant will ask if you want to format the drive for Mac or PC. Within seconds, the unit will be configured to Mac OS Journaled (and therefore Time Machine ready). The drive also comes pre-installed with LaCie Backup Assistant to help you manage your backups as well. For the Rikiki drives, LaCie qualifies a number of drive mechanisms from different companies, including Hitachi, Seagate, Samsung, and Fujitsu. Our drive’s mechanism was a Seagate 5400 RPM ST9500325AS-566. Many have strong opinions about the difference in reliability between the company’s drives, but like many companies, LaCie feels that after qualification they are all on par. (Macworld Lab doesn’t make any special requests on hard drive mechanisms, only that the mechanism be a final version that will be available to the public.) Regardless of the mechanism’s manufacturer, the hard drives used the in Rikiki are all 5400 RPM. We tested the 500GB model, but LaCie also offers 640GB and 250GB models. The 500GB model retails for $110, giving it a price per gigabyte of $.22. For a portable hard drive, you can’t get much cheaper than that. In our tests, the Rikiki performed adequately, but not exceptionally. Its copy tests finished at 42 seconds and its duplication tests took almost 70 seconds-both average times for USB 2.0. In fact, the times were slightly better than OWC’s Mercury Pro AL Mini’s USB 2.0 results (the Mercury Pro is a quad interface portable drive). The AJA tests confirmed the strong read/write speeds of the drive, finishing at 28.1MBps and 36.8MBps-on par with the Mercury Pro’s USB read/write speeds. Unfortunately, the Rikiki did not fair as well in our low memory Photoshop test. The Rikiki took well over four minutes on average. The Mercury Pro’s slow times were good in comparison to the sluggish pace set by the Rikiki. 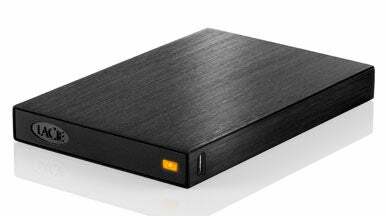 Audio/visual professionals normally won’t look for a portable drive to backup all their media files; but if they did, the Rikiki would be a poor choice. We haven’t seen a really compact portable hard drive in a while. While the Rikiki will likely be competing with Iomega’s well-regarded eGo Mac Edition ( ), there are those out there that prefer LaCie’s drives for the aesthetics, bundled software, and reliability. LaCie proved with the Starck line that they can innovate and provide style to the market; here they are merely seeking to offer a solid, no-frills drive that you can take anywhere.